The Greenwood Suite features 525 square feet of private living space with dedicated entrance, living room, separate bedroom with bathroom, enclosed porch, and kitchen. 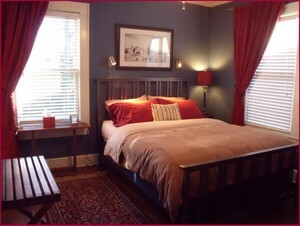 Your bedroom features a queen-size bed, private bath, and a small TV/DVD player. 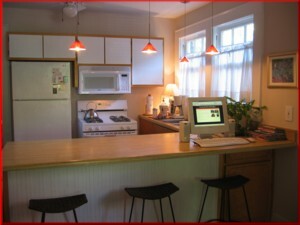 Your own personal kitchen is available for light cooking. A desktop PC and printer are provided for internet access at no extra charge. Wireless internet access for your mobile devices is also available free of charge. 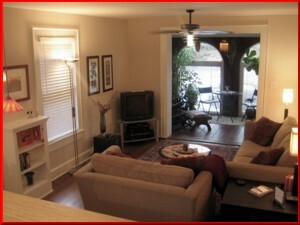 Relax in your private living room or visit with family and friends. The larger sofa converts to a full-size bed that can accommodate two additional guests. A TV, DVD player, and stereo are also included. Kick back in the rocker and enjoy a good book. 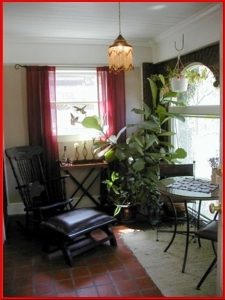 Request that your breakfast be served in this lovely enclosed porch. 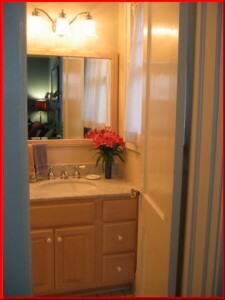 Your private bathroom, which is accessed from the bedroom, has a standard tub/shower.